As my due date gets closer and closer, my urge to cook has really tanked. 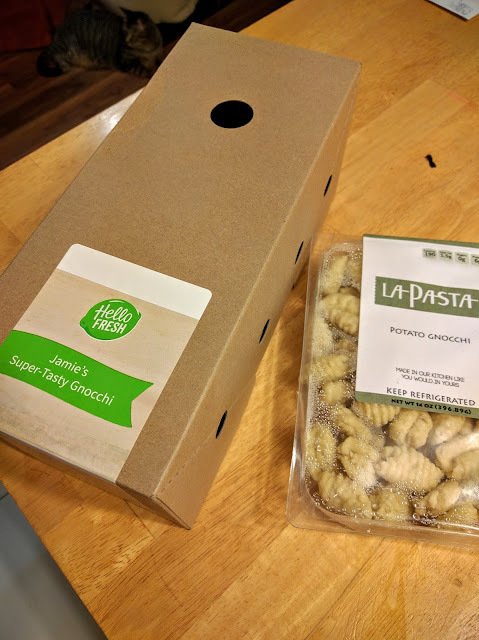 So, I was super happy when my friend Ashley over at NeverHomeMaker did a Hello Fresh box giveaway, and I won! The first meal in the box was Jamie's Super Tasty Gnocchi. This was so tasty and easy. 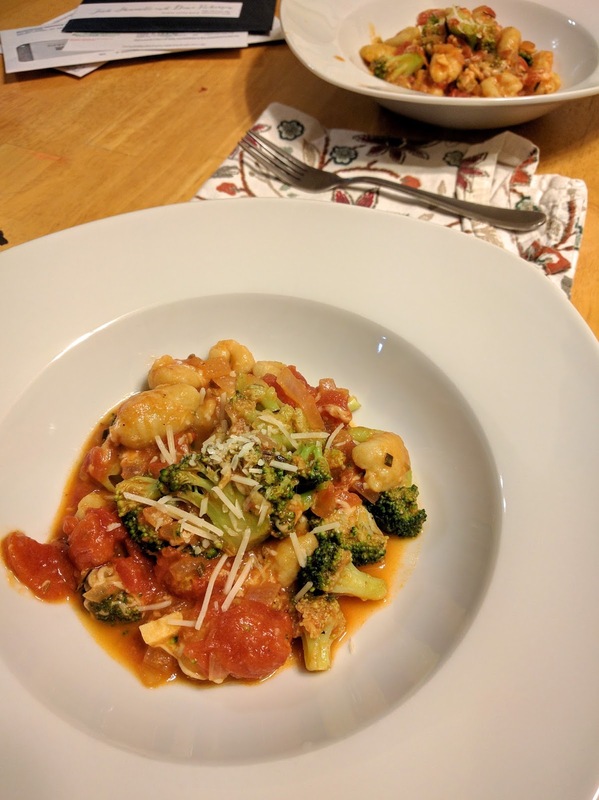 You basically boil the gnocchi, cook down the veggies, and toss it all together. 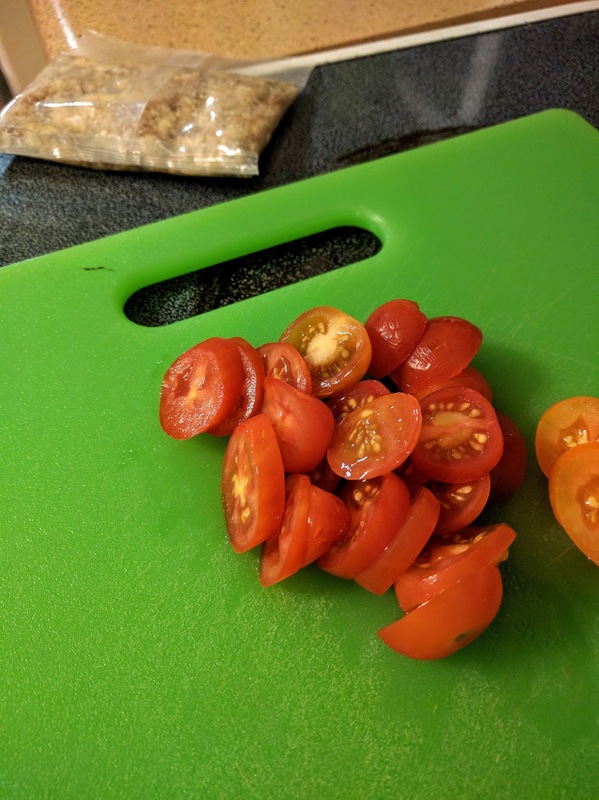 This made a TON of gnocchi. It was definitely enough for 4 servings. The next meal we tried out was the Heirloom Tomato Flatbread. I had some leftover sausage for Josh from the farmer's market, so I put that on half. He's really been enjoying the veggie meals, but of course, he would prefer meat. This seemed like a good instance to throw some on. I expected this meal to not be terribly filling, thus the extra gnocchi in the picture, but it was SO filling. 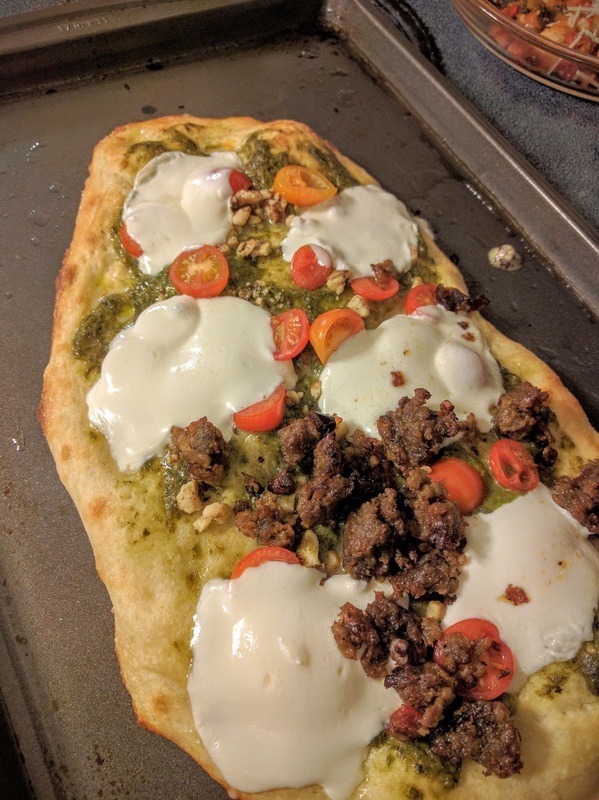 The crust was fluffy, the pesto was creamy, and the mozz cheese was great. The dish came with arugula tossed with balsamic and olive oil, which we topped our pizza with. 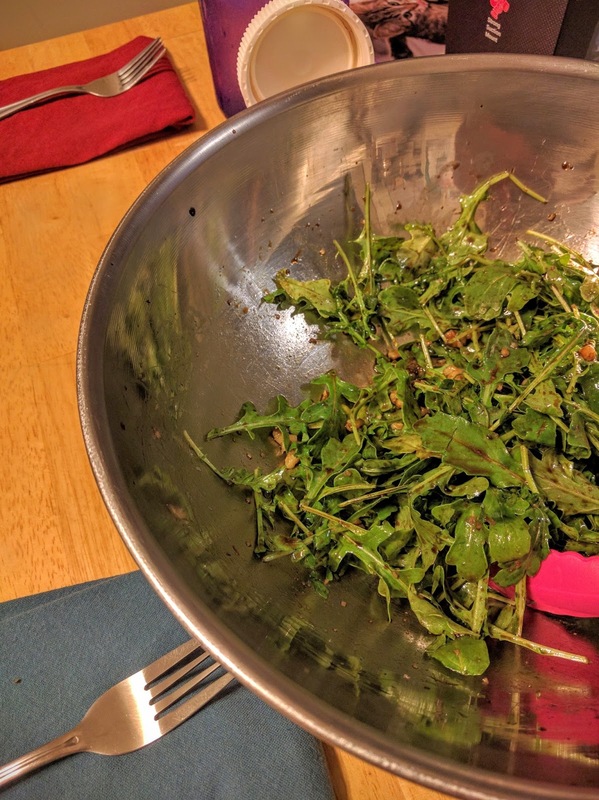 Now, I'm not a big fan of arugula, so I tried it, but mostly left this off. The third meal that came in our box was Quinoa Stuffed Peppers, which unfortunately, we didn't eat. 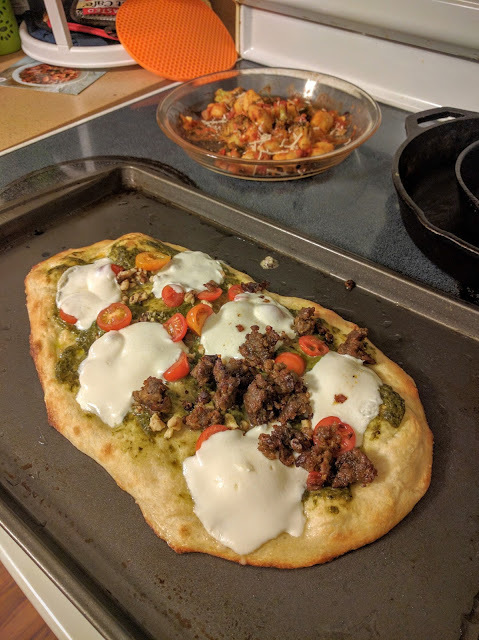 It looked tasty, but we just never got around to making it. 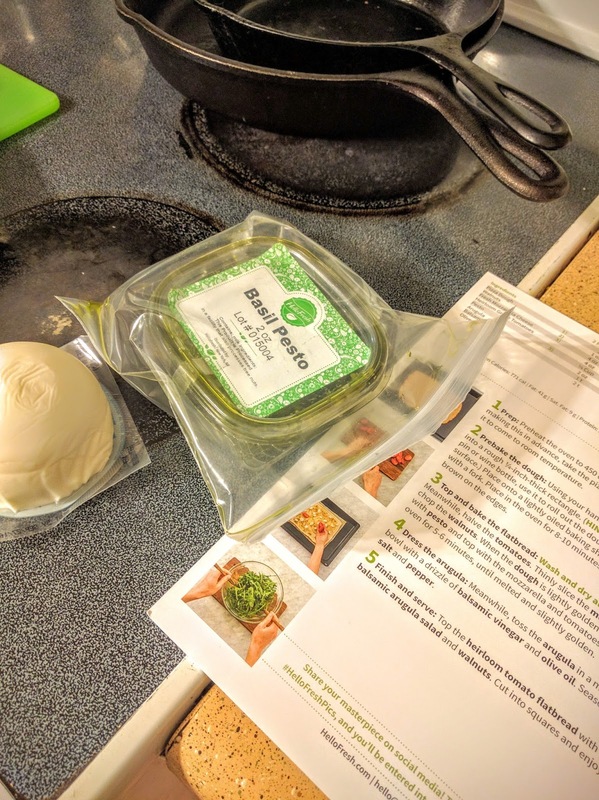 Apparently, even though Hello Fresh is easy, it was still more than I wanted to mess with as pregnant as I am. I think that dish didn't sound as great as the other ones. It did look great. I am not getting anymore boxes right now, but I think it's a great option for busy people. The boxes are 60 bucks and come with 3 meals, which says 2 servings a piece. I think the servings are crazy generous, though, so you could possibly get two meals out of each. So, I would definitely give this a try, if you are looking for some easy meals. Now, I don't think this would be the best for vegans, because you don't get to customize the vegetarian boxes. The meat boxes give you the option to pick which 3 recipes you want. But, if you're a cheese/egg eater, it would be an easy way to get some creative dinner ideas into your kitchen. This post is not sponsored at all. I won a free gift box and tried it out. All opinions are my own. I'm not a fan of arugula either. Both meals looked really tasty! I can't believe the day is almost here! You must have so many emotions!! So many! Mostly I'm just ready for her to be here. We got a deep freezer this weekend, so I'm going to be making a lot of minimalist baker pot pies this week for post-baby, haha. After reposi tioning the brand, the most important highlight of Louis Vuitton Handbags and Original Rolex Watche in fur top luxury flagship product category.The 1:1 Replica Breitling Watches in July last year held their first couture show called “Fashion furs” in Paris.The company also plans to invest heavily in prominent brands of Rolex Air King Italian descent.Omega Watches Replica?is the most famous luxury watch brand all over the world.That global recognition is the Replica Tag Heuer product of decades of success in a range of fields. شركة تنظيف فلل بالرياض عمالة فلبينية, Inc, Petitioner, v. Department of Labor & Indus., Respondent. I no longer experience that washing a home warrants a $25/human resources charge, particularly if I'm offering the washing items. Clients want their homes cleaned thoroughly on a consistent basis without any complications. No remedy, I emailed her the next day time and I got an email saying that the cleaners experienced that they did the best they could esp. The truth that you no longer desire to spend for, or make a complaint about the price tells me that you're only a lazy person that desires to possess somebody clean their disgusting sty and desires to spend nuts. I have always been therefore bad that the initial washing don't move simply because well. Your cleaner will show up promptly and you'll be notified when they start and finish cleaning your house. اسعار تنظيف المنازل بالرياض Choosing to have a cleaning business and be even more obtainable as a mom to my 5 kids was a reasonable choice. We agreed on a price of $100 for my house, which is usually affordable. I pay an hourly rate based on what you are worth once you have the hang of points. Normally a private person offers been more accommodating and performed better for us. It is definitely their business and it seems they are more worried about the quality of function. She worked شركة صيانة مسابح بالرياض well SOOOOO very difficult that I went ahead and added an extra $100.00 because of the quality of work and all the extras she did that I did not know required to end up being cleansed like my blinds, the light accessories, etc... I also supplied lunchtime for them. You can't actually depend on the family's very own car filled up with buckets, mops and washing items, at least not really for longer, as it's as well sloppy and will take apart a automobile from everyone else requiring it. If افضل شركة تنظيف بالرياض you're washing using the client's items, you might obtain apart with using general public transportation; normally, you'll need some means for getting to and from the houses, especially if they're in very different areas. If you avoid think its fair to pay these people for what they do, then Avoid DO IT! From my experience most companies don't make a list of what's getting included and what's not really included in the move-out washing program and I acquired to move over صيانة مكيفات بالرياض each of my worried products to consult them. First cleans are also even more costly, as cleaners need to determine how long they'll spend in a home, and if there are any rooms which require extra work - for example a family bathroom or large play area.